With at least 129 active volcanoes and daily earthquakes, Indonesia is the most geologically diverse and volatile place on the planet. 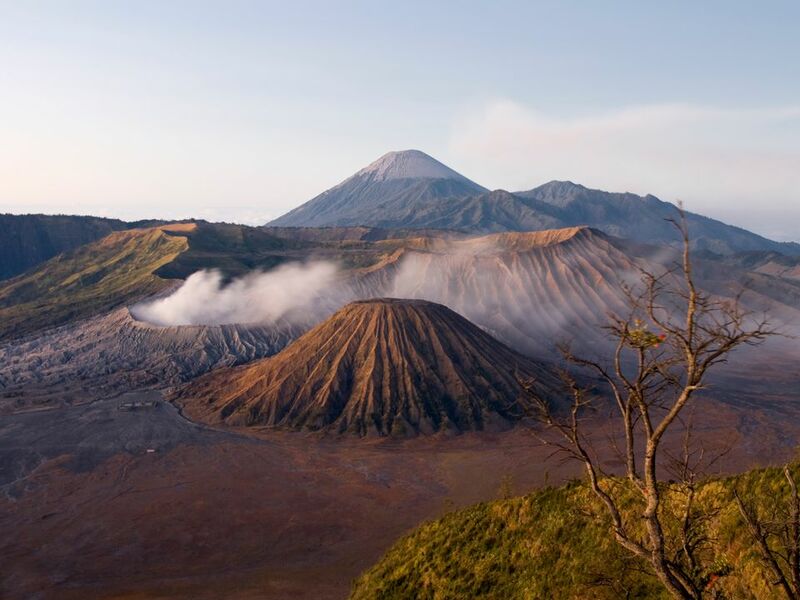 Mount Bromo in the eastern part of Java isn't the tallest of Indonesia's active volcanoes, but it is certainly the most visited. Easily accessible, tourists hike to the rim - situated at 7,641 feet - to observe the otherworldly landscape that is often found on so many Indonesian postcards. Sunrise from the top is truly spectacular. Unlike the cone of Gunung Rinjani which is surrounded by water, Mount Bromo is surrounded by a plain is known as the "Sea of Sand" - fine volcanic sand which has been a protected area since 1919. The caldera is a lifeless, bleak reminder of the destructive forces of nature when compared to the lush, green valleys below the peak. Although not as active as the nearby Mount Semeru which is in a continuous state of eruption, Mount Bromo's plume of white smoke is a constant reminder that it could explode at any time. Two tourists were killed when a small explosion occurred at the peak in 2004. Mount Bromo is one of three monolithic peaks situated in the Tengger Massif caldera in the Bromo-Tergger-Semeru National Park. Most travelers visit Bromo from the base town of Probolinggo, just a few hours from Surabaya and around 27 miles from the national park. The journey from Surabaya to Probolinggo takes about three hours by bus. The village of Cemoro Lawang - the usual starting point for backpackers - is around three miles from Ngadisari, located on the border of the national park. The views of Mount Bromo's eerie landscape are best just as the sun rises. Unfortunately, this means a 3:30 a.m. wake-up and braving near-freezing temperatures in the dark while waiting for sunrise. Organized tours by bus or jeep are available, however, Bromo is best enjoyed without the help of a guide. The national park is easily explorable on your own and there are many options for viewing Mount Bromo. The most popular option for backpackers is to sleep in Cemoro Lawang, the village nearest the rim, then walk the well-defined path (less than one hour) to witness the sunrise. Life in Cemoro Lawang is oriented around the early mornings and restaurants are open for breakfast serving delicious Indonesian food. Another option is to climb or take a bus up the paved road to nearby Mount Penanjakan. The concrete viewing platform offers stunning views of the Caldera but gets busy with tour groups in the morning. Most of the tour groups come only for sunrise and depart soon after; sticking around a little longer may provide you a chance to enjoy the trails and viewpoints in relative solitude. Flashlight: The trails are relatively easy to follow but are extremely dark before sunrise. Water: Despite the cold weather, you will find yourself sweating on the trail. Warm Clothing: Temperatures are surprisingly cold around Mount Bromo. Ask anyone what they thought of the sunrise and they will tell you that they were too cold to notice! Temperatures are cool year-round in the national park, but dip down to near-freezing at night. Dress in layers and expect to be cold waiting for the sun to rise. The guest houses in Cemoro Lawang don't always provide adequate blankets for the cold nights. The dry season in Java is from April to October. Hiking around the national park during the rainy season is more difficult due to slippery paths and volcanic mud. The entrance fee to the national park is around the US $6. Mount Senaru is the highest volcano in Java and is dangerously active. Impressive and daunting in the backdrop, a trip up the volcano is only for the adventurous and well-prepared. A guide and permit are required for the strenuous, two-day trek to the top. Nearby Mount Batok appears as the muddy volcano in the center of the caldera. No longer active, Mount Batok can be hiked to with relative ease from Mount Bromo. Hiking from Bromo to Mount Batok and then around Mount Penanjakan takes just over a few hours at a steady pace.